Traveling to Japan was one of my biggest dreams realized- the food, the fashion, the culture, and the people. All were everything I imagined and more. My husband and I felt extremely lucky to spend the day with Akiko Kanna, a celebrated nutritionist and chef. Not only did we get to walk the infamous Tsukiji Market in Tokyo with a pro, learn about all the fascinating ingredients and vegetables Japan has to offer (now I may actually be able to shop properly for groceries in Japantown), but we also got to travel to Akiko’s home to cook side-by-side with her father. Akiko will have two new babies to celebrate this year- one from the belly in October and a new cafe with her father as chef in May. 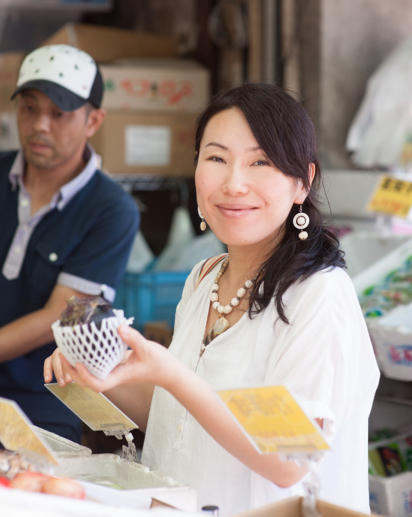 Akiko shares her wonderful stories and recipes below. After I graduated from school, I got a job at The Discovery Channel Japan as a production assistant, and then went on to a PR agency. In both jobs, I worked tremendously hard and had the wonderful opportunity to travel the world. It was a great adventure and I loved every moment, but the hours and work were exhausting. The stress was all taking a toll on my body and health.